I don’t use all caps much in any of my writing, online or otherwise, but my journal for July 8th starts “MAGICAL DAY!!!!!”. The five bangs are unusual too. It was going to be hot, that I knew. It was already in the mid-80’s before sunrise, the coolest part of the day, even at Brown’s Ranch where it is typically cooler than the city. I was still getting used to hiking in the desert so while I planned to be back before the heat got severe I chose trails I had hiked before and where I had cell phone coverage just to be safe. The chance for a lovely sunrise fizzled as the overnight clouds dissipated as I drove out in the dark. I didn’t see many animals in the early morning light and fumbled with my camera even when I tried for pictures. Some days are like that, I learned long ago not to fight it, I was just happy to know that as long as I got out early I could still hike on the hottest summer days. I reached my turnaround point at Cathedral Rock and stopped for a water break, taking a group photo for some cyclists who were also out enjoying the summer morning. 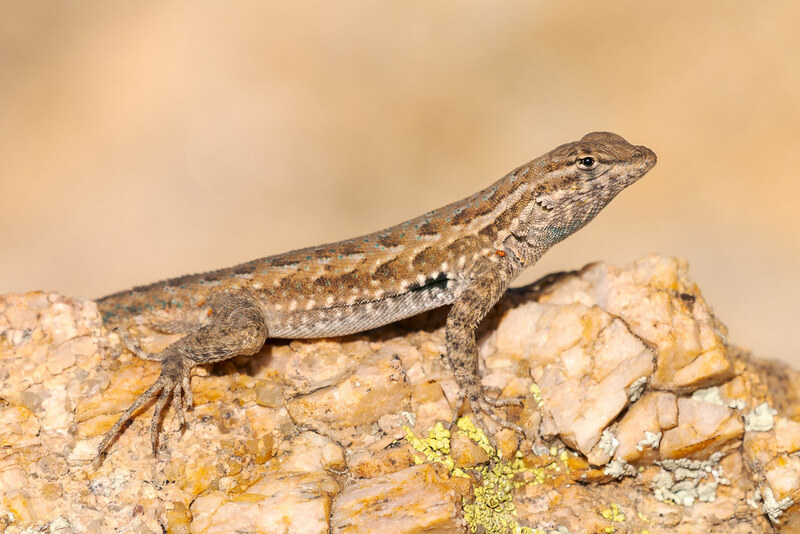 I saw a desert spiny lizard but couldn’t get a picture as it scampered behind a rock. 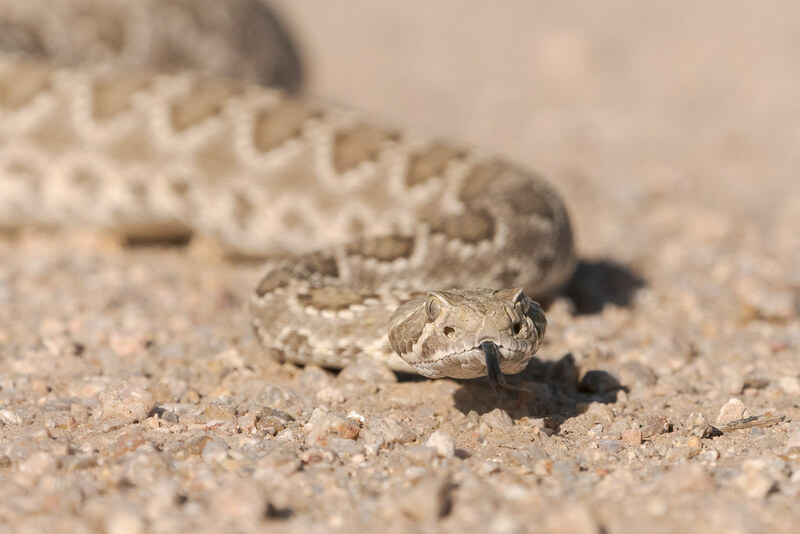 I had started seeing them on the trails on occasion, despite their size they are rather skittish so I wasn’t expecting any pictures. 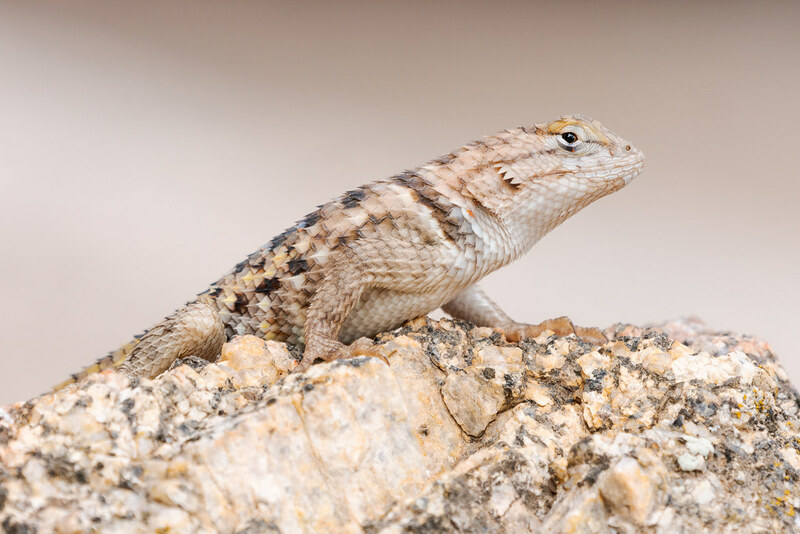 I sat there for a while, enjoying my new desert home, when the spiny lizard came out again. I didn’t move, taking some pictures from where I sat, and the lovely little thing got more comfortable with me. It scampered over underneath the massive rocks that make up Cathedral Rock and as I slowly approached it let me take some more pictures. Another group of cyclists came up and I thought the lizard would disappear but instead it came closer to me. At one point it ran right in front of me and snagged an insect off the rock wall a few feet to my left, I didn’t risk any pictures but turned my head enough to watch it eat its breakfast. It stayed near me for quite some time and I took so many pictures even I decided it was enough. I put my Canon camera in my backpack but thankfully still had the Sony out with the long lens attached as I turned around and my lizard had suddenly grown larger and more colorful. I quickly realized another lizard had come out (a male? an adult?) and took pictures of it as well, then walked around a bit, before I decided to head back as the heat was rising quickly. 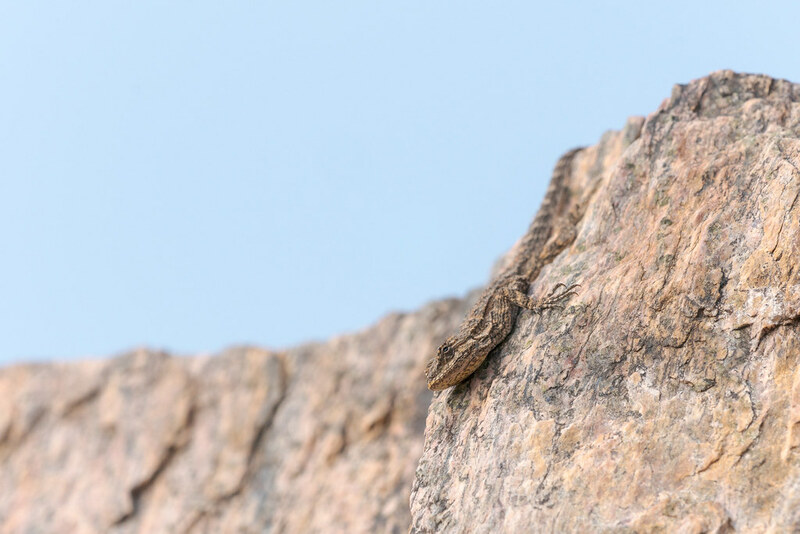 I attached my tripod to my backpack when I noticed the first spiny lizard was now perched on a rock right beside me. Having so completely earned its trust I couldn’t resist more pictures, I took this one sitting on the ground with the lens resting on my legs, relying on the flip-out screen to frame the image. Then it really was time to go, having spent 2 hours and 15 minutes with the two lizards. It felt good to stretch my legs as I headed back to the trailhead, and though it was 101 degrees as I reached the car I didn’t mind. I had plenty of water, I had plenty of energy, and my heart was full of joy. I hope there are little things in your life that bring you as much joy as these tiny lizards bring to me. The common side-blotched lizard is the lizard I see most although they can be difficult to photograph because of their small size. Most of the time I just watch them sunning themselves or scurrying about and am thankful they are there, and I with them. 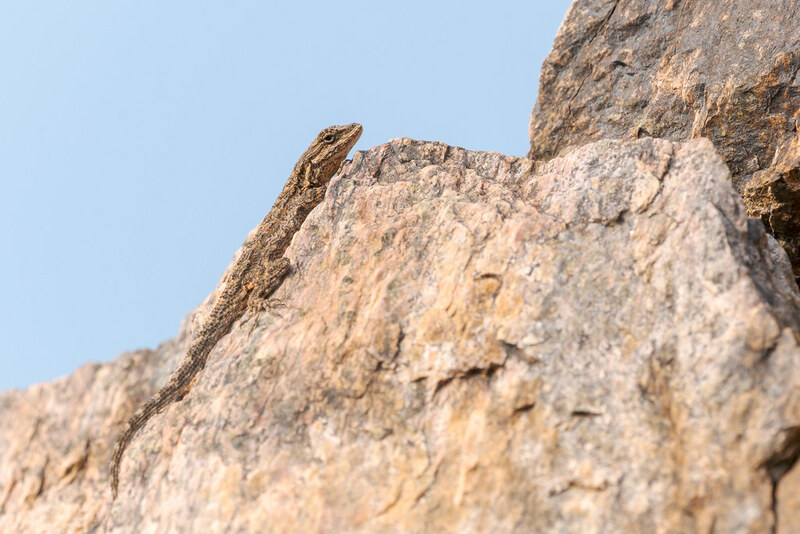 An ornate tree lizard climbs up a jumble of rocks at the Piestewa Peak Summit Trail in Phoenix Mountains Preserve. 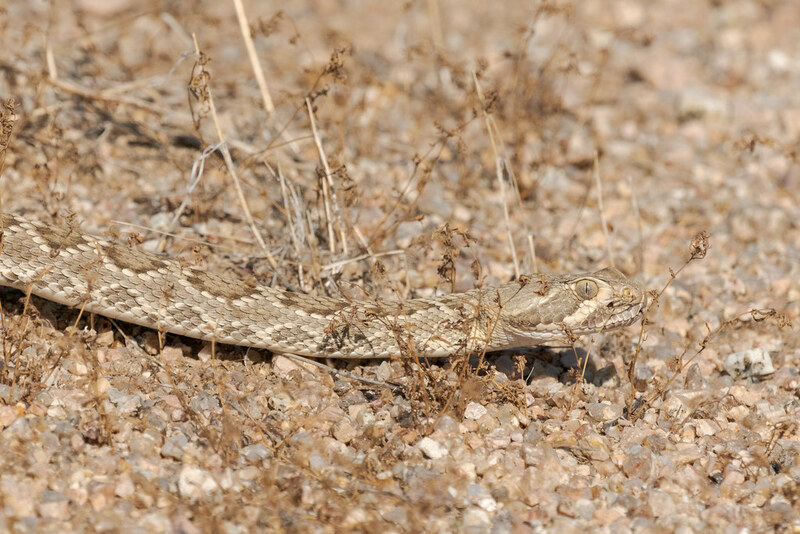 This Mojave rattlesnake appeared large in the viewfinder but was a safe distance away when I began to photograph it. Even so, as it crossed the trail and started moving steadily towards where I was (having given it a wide berth and gone off-trail to let it choose its path), I pulled the camera away from my eye occasionally to get a clear view of how far away it actually was. It was well aware of me and headed over to my right so I sat still until it chose a bush to curl up under, then I continued up the trail. I came across this flattened lizard (a tiger whiptail I think) and took some time deciding if I was going to photograph it or not. Finally I changed lenses and took a picture as a tribute to this once beautiful creature as ants swarmed the lifeless body. 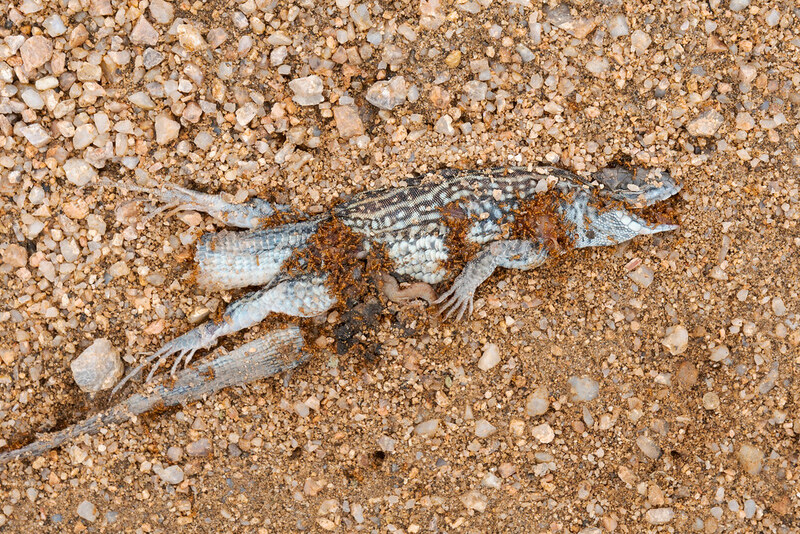 The lizard had shed its tail, now lying beside it, in an unsuccessful attempt at saving its life. The trail is heavily used by mountain bikers so perhaps it wasn’t able to get out of the way of a bike or perhaps a predator killed it but got scared off before it could eat its meal. Or perhaps a hiker stepped on it, someone once stepped on a newt I was photographing (fortunately the ground was soft and the newt unharmed).